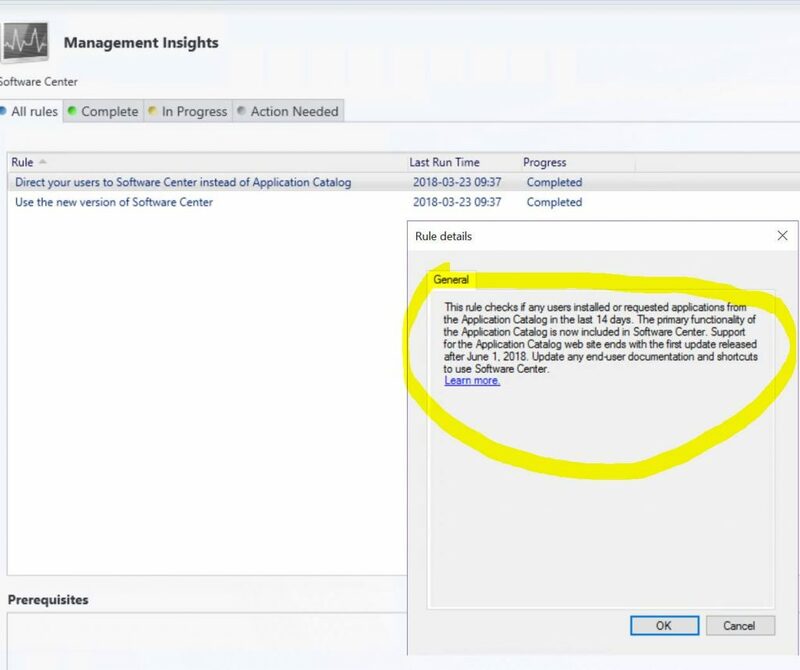 The Application Catalog in SCCM (Current Branch) will no longer be supported after June 2018 | just another windows noob ? ← What version of the Windows ADK is supported with System Center Configuration Manager (Current Branch) version 1802 ? System Center Configuration Manager (Current Branch) version 1802 was released yesterday. You can read the official announcement here and for a detailed list of what’s new, please see the following blog post. I blogged about how you can upgrade to 1802 here. One of the changes related to Software Center , is that the Application Catalog will soon be unsupported and to encourage users to use the Software Center instead of the Application Catalog. The Application Catalog (website) was introduced way back in 2012 so that users could request, search and install applications in a consistent way. However, the functionality it provided has been migrated over time to the all new Software Center, and as a direct result of this support for the Application Catalog will be removed as of June 2018. Thanks Johan Lindbergh for the graphic. This entry was posted in System Center Configuration Manager (Current Branch). Bookmark the permalink. Pingback: Microsoft Silverlight to be removed from SCCM (Current Branch) June 2018 | just another windows noob ? Hi Niall, does that mean that we can remove both the Application catalog web service point and website point and be able to only use software center to do most of what we used to do with the application catalog once we migrate to 1802?